A day after police told a court in Addis Ababa that they have found a mass grave in an area between the Oromo and Somali regions in Eastern Ethiopia containing the bodies of about 200 people, president of the Somali region told ESAT that investigations were underway on “several” mass graves found in the region. In a brief comment to ESAT on the news of the founding of a mass grave containing the about 200 bodies that was disclosed in court yesterday, Mustafa Omer, president of the Somali region, said the regional government, together with elders, are conducting forensic investigations on “several” mass graves found in the region. He said the report by police of a mass grave containing 200 bodies was a separate investigation by the federal government; and that his government is also carrying out investigations on several mass graves found in the region. He said results of the investigations would be announced soon. Police was investigating the case of the former Somali regional president Abdi Mohamoud, also known as Abdi Illey, when they uncovered the presence a mass grave containing the bodies of about 200 people in the restive region bordering the Oromo and Somali region, the scene of ethnic clashes and displacement of over a million people just a year ago. 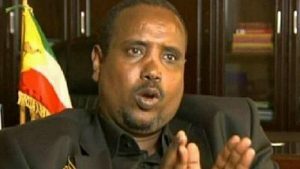 Mustafa Omar replaced Abdi Illey, who was arrested in August accused of violations of human rights, including inciting ethnic and religious conflict in the restive Somali region in Eastern Ethiopia. The Human Rights Watch and other rights watchdogs have been calling for justice in the Somali region of Ethiopia, implicating Abdi Illey and other regional officials in gross human rights violations as well as ethnic and religious strifes. A report on Jail Ogaden and other reports by the Human Rights Watch implicate Abdi Illey and his special police unit, the Liyou Police, of torture, killings and imprisonment of innocent citizens. Hundreds were killed in clashes between the Oromo and Somali ethnic groups last year as over a million people were displaced leading to a serious humanitarian crisis. A court in Addis Ababa granted police additional 14 days to carry out forensic examinations on the 200 or so bodies found in the mass grave and wrap up investigations on Abdi Illey.